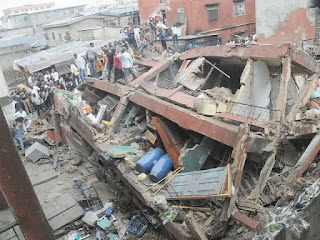 The Lagos State Government on Tuesday set up an investigative and advisory committee on the building that collapsed at No . 53 , Massey Street , Ita - Faaji , Lagos Island. The Commissioner for Physical Planning and Urban Development, Mr . Rotimi Ogunleye, during the inauguration in Alausa , said members were carefully chosen to provide government with informed advice on the steps to take in respect of the collapsed building. The three- storey building with a penthouse collapsed on March 13 , leaving some 20 persons dead and many others injured . One of the floors of the building housed a nursery/primary school. He said that 149 buildings have been marked for demolition across the state , out of which 40 were pulled down in the first phase of demolition last year. He said that out of the 149 distressed buildings, 48 were located on Lagos Island , and so far , 16 distressed buildings had been demolished on the Lagos Island alone. Ogunleye , who debunked claims that many persons had been rendered homeless by the spate of demolition, clarified that statutory notices, including quit order, were usually issued before any building was demolished. The commissioner said that the committee, comprising professionals in the built sector , had a two - week term of reference, while the recommendation of the committee would be acted upon, as government was determined to stem the tide of collapsed buildings in the state. In his remarks , chairman of the committee, Mr . Wasiu Olokunola, a certified civil and structural engineer, promised that they would carry out the task with utmost professionalism.